Controlling fleas before they cause you an infestation is a very wise move. These parasites can carry diseases such as the plague, typhus and tapeworm. None of us want our families or our pets to be bitten by fleas so a natural ways to control them should be used as much as possible (it is better to be safe than sorry!). There are many methods and techniques, so if you are reluctant to use products which could contain harmful chemicals there are several alternatives. 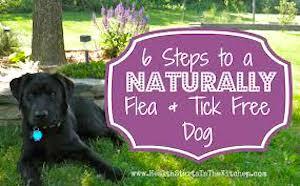 Natural flea control can be exercised in the home, yard, on our pets and on us. In the home, a natural flea control method to prevent growth and spread of parasites could be as simple as regularly cleaning. A fully sanitised and vacuumed home could reduce the chances of these pests settling in. Frequently wash all bedding (certainly the pet’s), sofa covers, rugs, mats, throws, sheets and any material furniture that they could potentially infest. Homemade traps are a good natural flea control if you want to see if you have a flea problem on your hands. As fleas are attracted to warmth and light, an easy way to make a trap is to fill a bowl with warm water. Mix in a healthy squeeze of liquid soap and then (safely) place this next to a lamp, in the area you believe pests may be. The light should coax them in and once they hit the water, they will sink to the bottom and drown. Look to prevent access to fleas and any other unwanted pests that may bring them into the home (rats, mice and squirrels for example). Filling any holes, cracks and crevices around doors, windows and radiators, all act as a natural flea control. In the yard, natural flea control methods could include the planting of flea repelling plants. There are a number of plants linked with repelling parasites such as lavender, mint, eucalyptus and rosemary. Not only will these repel fleas, but they look good, smell good and could be used to make repelling sprays for you and your pets (not always for cats). 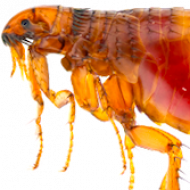 It sounds repetitive, but a natural flea control method is regular cleaning, even outdoors. Mow the lawn so you can see what’s happening in the grass; sweep up any leaves and piles of dirt or rubbish. Check the dark and shaded areas regularly to see that there are any parasites appearing (under shrubs, plants, under decking or next to kennels). It sounds nasty, but it’s quite possible a wild animal could die and decay in a yard that’s un-kept. Fleas could feed off the animal until a point where they look for a new hot blooded host. A natural control product that can be spread in both the yard (and on carpets in the home) is diatomaceous earth. This can be bought at the local garden center. Be careful not to inhale it. For our house-pets, there are many natural flea control methods. Some are consistent with others when researching on the internet and some are not, so the best suggestion would be if you are unsure always consult a veterinarian before using any treatments you have heard could be potentially harmful to house-pets. For example, some say a supplement of garlic to your pet’s daily meal could help in repelling fleas – this sounds fine for dogs, but not cats (and certainly not puppies or kittens) as garlic is toxic for cats (as are onions and shallots). The garlic makes the pets body odor less attractive to fleas. The most consistently agreed natural control for pets is a healthy balanced nutritional diet. There are several natural supplements that can be added to your pets daily meal (ask your vet). If your cat or dog has a strong immune system, is fit and healthy (regularly walked and groomed) then these are all great natural flea control methods – which probably apply to humans as well! Brewer’s yeast is also good for adding to your pet’s meals and acts in the same way as garlic would. You could also add white vinegar to their water (diluted) and make flea collars and sprays from essential oils. Again, these are more suitable for dogs than cats as cats can find essential oils toxic. Signs are not always immediate, but if there’s any risk at all, look for other alternatives. However, for dogs (and humans) you can make sprays from lemon and lavender. Other methods (repellents) are chamomile near the cat’s basket and fennel near the dog’s basket. As mentioned above, natural flea control for humans could include a healthy diet. Homemade repellent sprays (careful with any allergies) could be sprayed over the body and clothes. Appropriate clothing when you are visiting potential parasite hotspots is a simple method to avoid flees. Cover the legs and arms and wear the right colors. Essential oils such as eucalyptus, rosewood, lavender, peppermint, tea tree, cedar, citrus or lemongrass will all act as a natural repellent. These can be diluted with water and placed in a container over night and used as a spray the following day. If you are looking of ways to kill parasites whilst you are sleeping, again homemade flee traps could be set up. • Natural smells, scents and odors to repel flees from the yard, house and from ourselves!